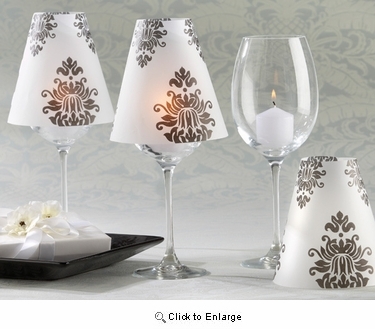 Turn ordinary Wine or Champagne Glasses into elegant centerpiece table lamp decorations. vellum shade easy to assemble 4.75" tall, made of frosty plastic. top of the shade is 2" wide and bottom is 5" wide/ when assembled. Place on top of a regular size wine glass. To make it shinning put led lights inside the glasses. 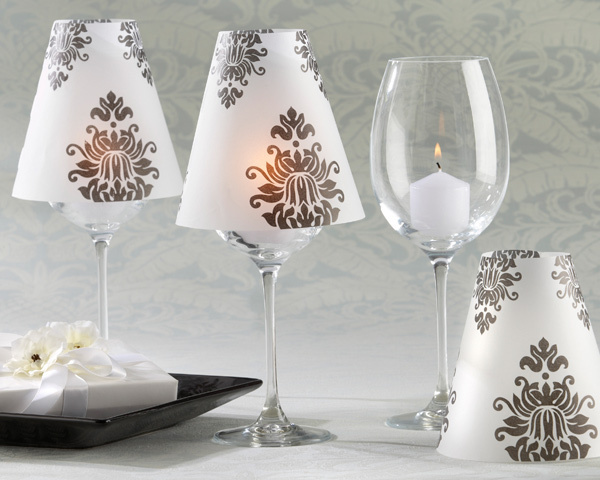 Turn those inexpensive wine glasses become fancy candle lamps when topped with above mentioned vellum shades. simply search or idearibbon.com home page by key words "led lights"
See the below picture as references.